At the center of the figure can be found a new way to present cyclic data on a gene. 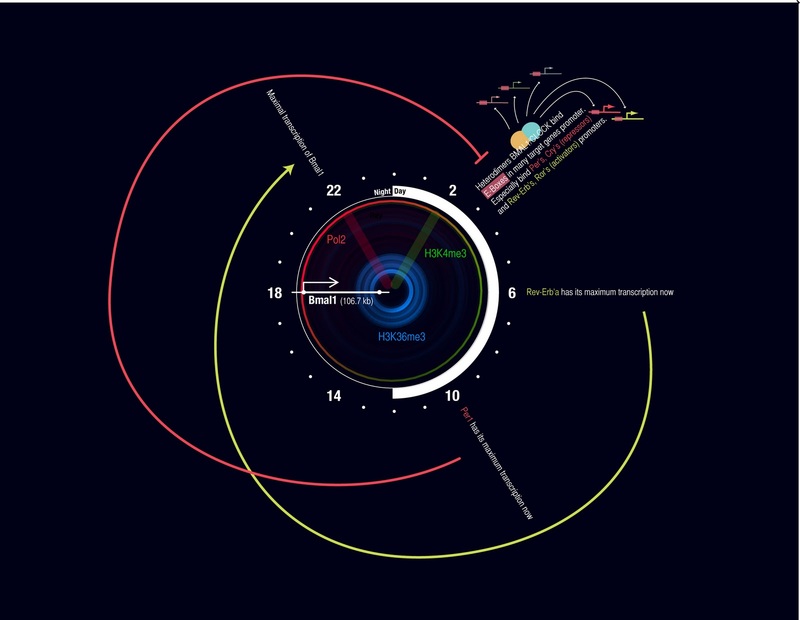 Here, the genomic location can be read on the radial axis (with the TSS at the outer position) while the angular axis holds the time. This figure presents the data obtained from 'around the clock' ChIP-seq experiments with antibodies against PolII (in red), H3K4me3 (in green) and H3K36me3 (in blue) performed with mice liver extracts. The measurements were token every 4 hours (at time-point where numbers are written) and these data were spline-extrapolated every 30 minutes. The times of the maximal levels of PolII and H3K4me3 are denoted by the thick semi-transparent lines of the corresponding colors. The levels are first maximal for PolIIm then for H3K4me3 and later for H3K36me3. This is generally observed for all cycling genes. It can also be observed that PolII and H3K4me3 are mainly located at the promoter while H3K36me3 is located in the gene body, increasing towards the end of the gene. Around this main figure, some other explanations on the circadian core network have been added. Notably the negative and positive feedback roles played by PER's and REV-ERB's proteins.